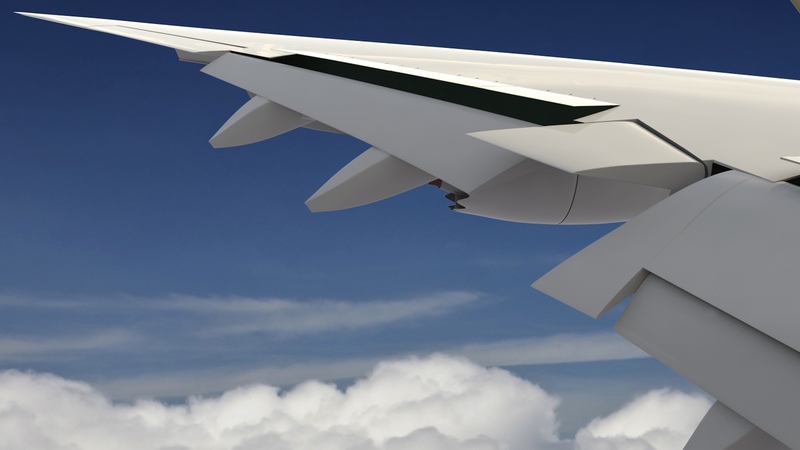 In 2010, I built the Boeing 787-8 "Dreamliner" so this aircraft seemed appropriate to do next, adding to the fleet. 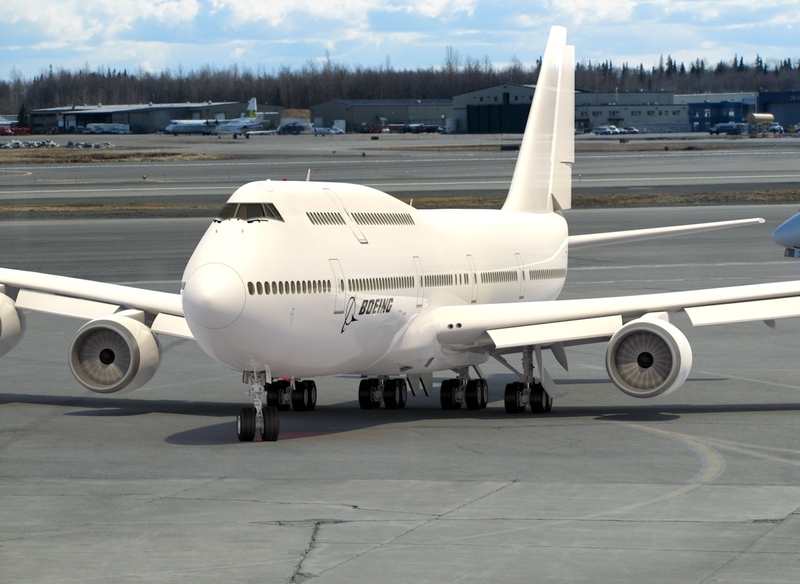 The Boeing 747-8 "Intercontinental" is larger, faster, and more efficient than previous 747 models, and includes, among other things, a redesigned wing and flap system, as well as the new General Electric "GEnx" engines. 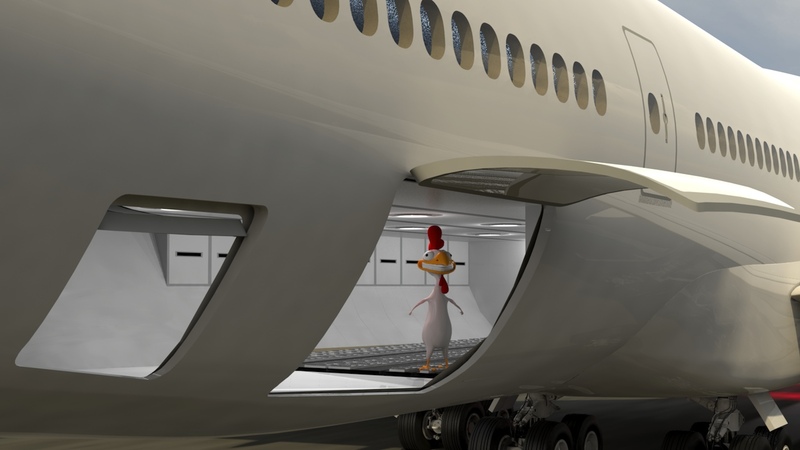 The 3D model includes a large amount of detail, and also quite a few rigging features, to be used in both still images and animation, in both day and night shots. Here, I've outlined some of the more major features. If you have any further questions, feel free to email me. Below: I shot this photo at Ted Stevens International Airport, here in Anchorage, and then composited the model into the shot. At the time I'm writing this description, this model, in native "lxo" format) is about 125 MB in size, and at render time, generates about 25 million polygons. It's important to note that this file uses MODO's "replicators" and "instances" to keep the file size from being much larger. 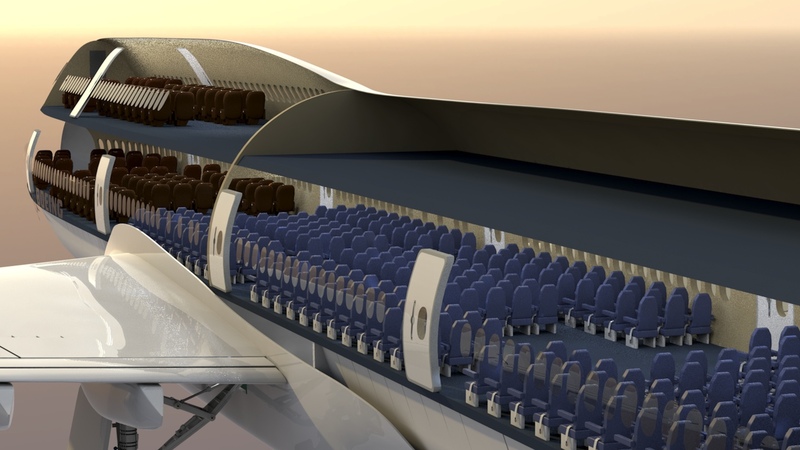 (duplicating passenger seats, for example) When translated to another file format, the file size will be quite a bit larger. The "Controller" and it's associated rigging controls may not translate to your particular non-MODO format. All of the geometry is still there, and can certainly be animated, but it may not be so "automatic" as it is with the native MODO file. Volumetrics (a smoke-like effect, simulating engine exhaust) were used for several things here. First, they were used, as you can see below, to produce puffs of smoke from the tires, on touchdown, produced from momentary skidding. Then, they were used to produce a very subtle exhaust stream from the engines. 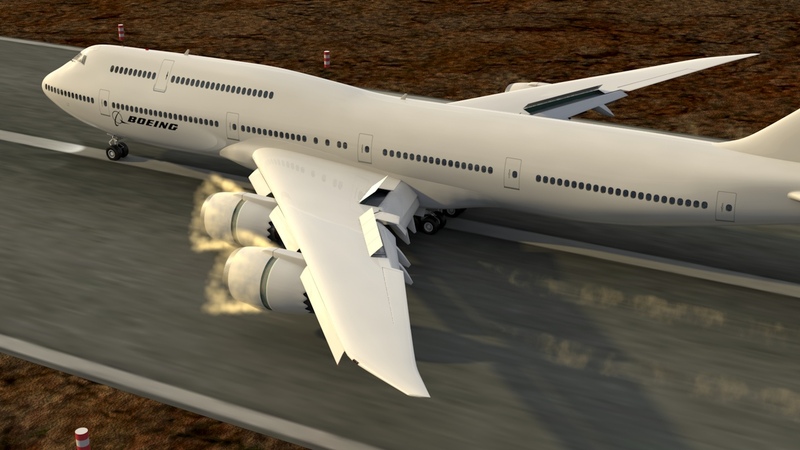 The rig is set up to slightly reduce the visibility of this exhaust stream, and turn on the reversed exhaust stream, when the reversers are activated. All of these streams are also spinning around their Z (length) axis, so that with motion blur turned on in later animations, it will be more realistic. 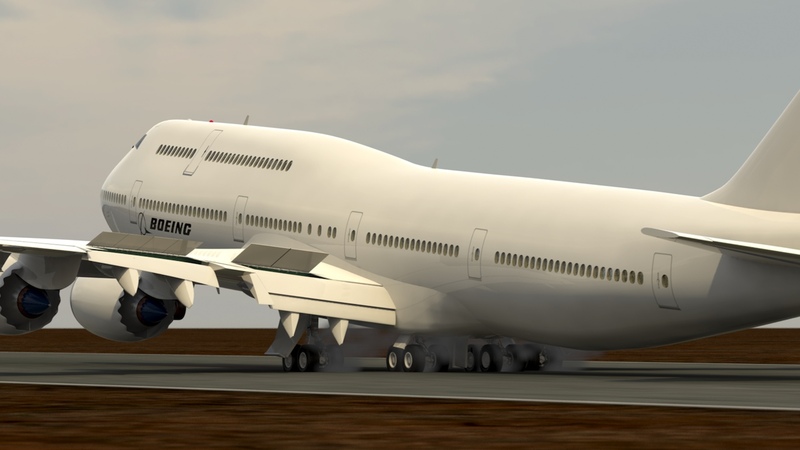 Below: A test of the volumetric effect on the thrust reversers. Normally, you wouldn't see any exhaust "smoke" like this, on the actual aircraft, unless it was a very wet day, so I'll tone this down a bit for the final animations. It uses vertex-based "sculpted volumes" in MODO, combined with a spinning (z axis) effect, to blur it further. 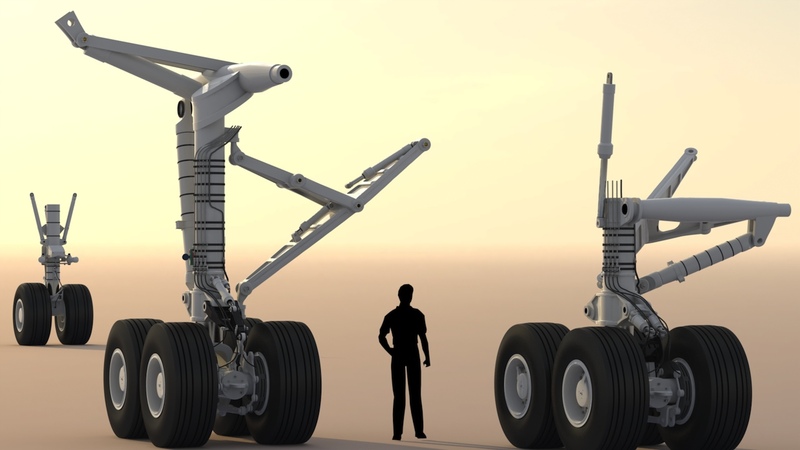 The controller for this rig moves the aft portion of the nacelle rearward, and as it moves, it uses (in reverse) MODO's "dissolve" function to make the exhaust appear. As the reversers close, the reverser exhaust fades out, and the normal rearward exhaust stream comes back to it's original strength. For your convenience, the "Engine Volumetrics" folder can be turned off, saving render time in one easy step. I'll continue adding external details, to the limit of my system resources, as this project moves along. These are the features currently implemented. 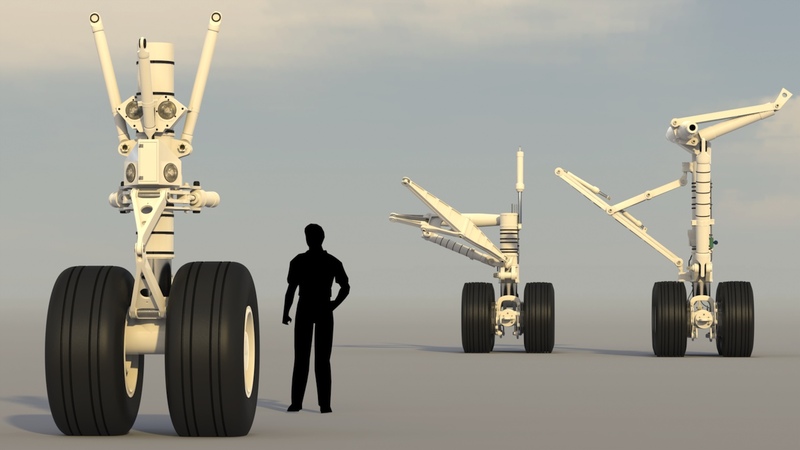 10 percent: This rotates the main landing gear trucks so that, when the aircraft is at a 5 degree angle (takeoff or landing position, with the nose wheel off the ground) the main wheels still sit flat on the ground, and continue to roll. 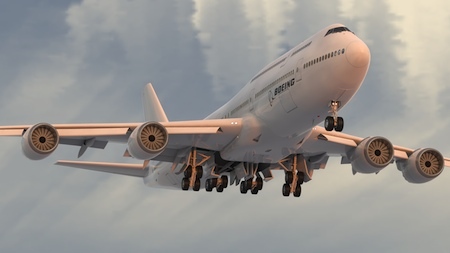 20 percent: (for just after takeoff, or just before touchdown) Main gear trucks rotate further, to their pre-retraction position, and the sequencing doors open. 100 percent: All landing gear is fully retracted, and all doors are shut. The entire aircraft's hierarchy is parented to a locator called "Aircraft Translation". This is the locator you use to manipulate the position of the aircraft. 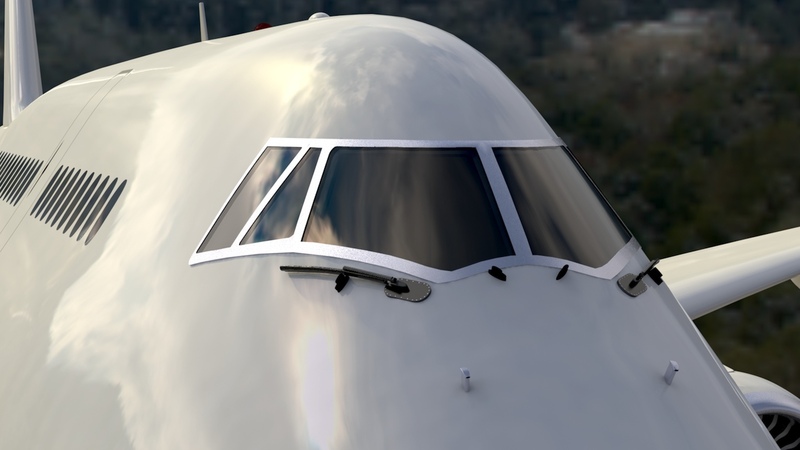 Clicking the second locator, called "Controller", (the cross-shaped locator visible above the aircraft) makes all the functions below available, through a simple display: Of course, all of these channels can be animated, too. I hope you'll enjoy producing some great still images and animations with this model.